Using Their Imagination, Preschoolers Can Gain Vocabulary Skills and Confidence. Ever wished you were someone else, even just for a little while? 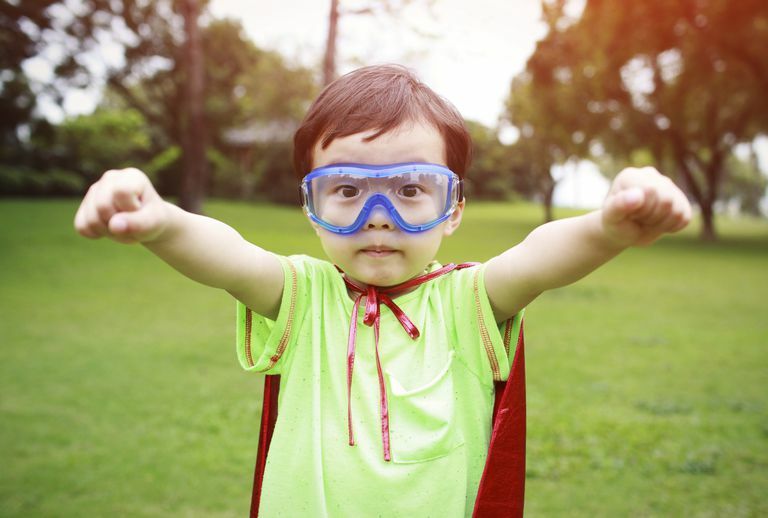 When kids play "dress-up," your preschooler can be anyone he likes, from a superhero to the king of the castle. And while kids playing dress-up is an incredibly fun activity for little kids, it's also a very important one, helping them build up their vocabulary as well as their confidence. Here's how to make the most of it. There is a reason why you'll find a box of dress-up play clothing in most preschool classrooms. Because preschool teachers know that when kids use their imaginations, they also are working a host of other important academic and emotional muscles. When your daughter dons "scrubs" (pajamas) and checks her dolls using a "stethoscope" (for my daughter it was a hair ribbon) her mind is going a mile a minute, practicing what she has experienced herself dozens of times. When he's imagining himself as a race car driver, he's actually learning — not to drive of course — but the actions of sitting in a car, buckling a seatbelt and putting the key in the ignition. And chances are, your child isn't silent when he's playing dress-up. If a restaurant is the setting of the moment, they are talking about drinks and food and cooking and the order at table two that they need to take. If she is on the moon, looking for Martians with a colander/space helmet on her head, she's got to figure out where to land her rocket and what color rock the alien is hiding behind. Even if your child is quiet while engaged in dress-up play, you can bet that their imagination is going at full tilt. Role-playing, especially when it happens with other children, encourages taking turns, cooperation, and socialization. Children that allow their imaginations to run wild become great problem solvers as adults. Why? Because creative thinking grows with use and practice and while trying to figure out how to rescue dolls from the bad guys doesn't seem like a pressing issue to you, to the superhero child, it's a quandary that has to be figured out immediately. First, make sure you have plenty of supplies (see list below). Keep everything handy and in a central location. And then get talking. Ask your child what he wants to be when he grows up or what would she do if she were Dora the Explorer. Encourage her to act it out, drawing out details. Don some of the clothing yourself. Most preschoolers won't need too much encouragement, their natural creative streaks will kick in. The list is never-ending and ever-changing, so update and add as you like. Gather everything together, wash it if you need to and keep it in a central location, maybe in an old trunk or suitcase. Keep it in the playroom or your child's room for easy access. The best part about an open-ended play is that there is no right or wrong, just fun.